We checked the sizing of this style with our Fit Check mannequins Huey and Dewey. They are wearing size Medium and XL jackets respectively. These are their “usual” sizes and they fit well… snug but well. We also checked the chest and belly of the other sizes and find them to fit OK too. Most people will be able to choose the size they normally wear in men’s clothing, but on a close-fit style like this I encourage you to measure your chest and belly and refer to the chart we have below. Choose a size that is big enough for your chest, and also make sure it will be big enough for your belly. The jackets taper quite a bit from chest to waist… about 6”. For example, we list the size XL as a 46 max chest and so the max belly for that jacket would be about 40. If your belly/waist is smaller than this, it shouldn’t be a problem, but if it is bigger, then you’ll have to choose a larger size to make it work. The Latigo 2.0 jacket is cut like a full-on sport/race jacket so the fit is very snug and the arms are forward leaning. A jacket like this is made to fit very snugly so we encourage you to evaluate the fit while in a riding position with the arms reaching forward. A good fit will feel good in this position, but may feel tight and restrictive in a normal arms-down standing position. The chart below is based upon our own measurements and the max chest sizes correspond to the tags in each jacket size. The sleeve lengths are from Cortech (which we find to be a good estimate) and are from the shoulder to the sleeve cuff end. Note: If you look up a Cortech size chart, you may find one that lists smaller chest sizes for each size listed above. 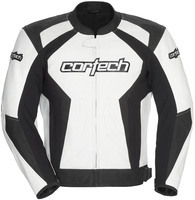 Cortech has caused some confusion about sizing by switching size charts a few times over the last few years. But we’ve checked this out thoroughly and feel our sizing advice is sound. This new Latigo 2.0 jacket is very sharp, I think. The last sport/race jacket they introduced was the Adrenaline in 2012. This Latigo is similar in overall function, but just has a few less race inspired features, so I think this one would be great for the everyday street/sport rider. The torso of this jacket is a combination of perforated and non-perforated leather as well as nylon stretch panels in the underarm area and down the sides of the torso. And the back has more leather and perf leather and some nifty accordion stretch panels behind the shoulders and above the elbows to improve the comfort in the riding position (arms forward). The waist has side adjusters to give a good fit. Another nice creature comfort is the soft neoprene band around the collar and cuff ends. For storage there are two hand warmer pockets with zippers in front and one inside wallet pocket (or for your electronics). For protection, there is a removable triple density back protector as well as C.E. approved armor for the shoulders and elbows. Of course the leather is quite thick and provides the resistance to abrasion if you fall. The ventilation on this jacket should be quite good by virtue of the perforated leather and stretch fabric areas… both of which will flow a lot of air. To help in cooler temps, the jacket does come with a vest-type liner for when the weather turns cooler. The liner should block the majority of the wind on the torso, but the insulation feels pretty thin, so as the temps drop, you may have to layer underneath. Just as it is, I’d recommend this jacket for very warm to cool conditions… maybe even cold with good layering underneath. The jacket comes with both a short rear zipper and a full around zipper for connection to sport pants or textile pants (your choice).